As an online auto insurance company trying to reach younger, Internet-savvy consumers, Esurance needed to do cool things with some cool friends to get noticed by its target. With this target and a challenger brand identity, it was natural to align Esurance with indie music talents. Because the category of insurance in the U.S. is perceived very negatively and because Esurance, as a new entrant, needed to establish credibility quickly, it was also natural to align Esurance with environmental values, one of the brand’s core differentiating propositions. Enter a relationship with the talented, independent, eco-friendly band, Cloud Cult. By successfully executing campaigns like these, consumers consistently named Esurance as the most innovative and the most environmentally aware company in its category. The band benefitted as well, seeing a dramatic boost in record sales. All the creative and communications developed for the campaign, in both art and copy, showcased an upbeat, green, fun, and quirky attitude– attributes shared by both the company and the band. The campaign earned honors in the form of a Gold Communicator Award for Best Green/Eco-friendly Integrated Campaign. I began working with the band in a unique multi-faceted relationship in which Esurance sponsored Cloud Cult’s tour to help make it carbon neutral. Esurance activation teams distributed info about this unique environmental partnership at a variety of events throughout the U.S.
Because the band and Esurance sought to encourage consumers in safeguarding our environment, all components in the campaign pointed to a themed micro-site where consumers could get educated about going green, learn about the band, and get free downloads of some of Cloud Cult’s music. The micro-site featured artwork from the :30 TV spot and long-form music video, ensuring consistency across media elements. The micro-site also linked to other elements deeper within the Esurance site, such as a personalized carbon emissions calculator tool and other content about Esurance’s ongoing environmental efforts. Strong sales copy points don’t always help you engage your audience. For Esurance’s advertising-averse target, music was sometimes more effective in getting messages across. 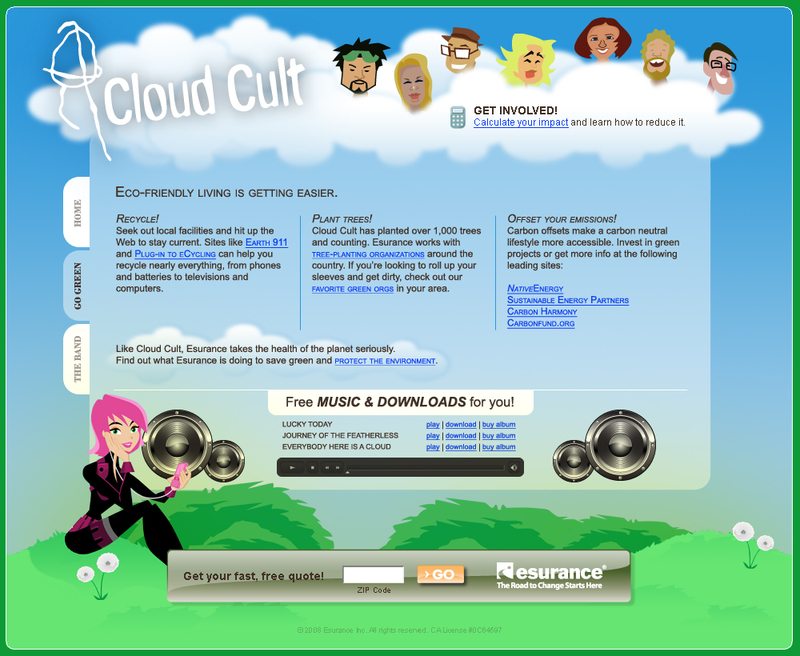 Cloud Cult allowed me to use their catchy song, “Lucky Today,” in a long-form music video that Esurance showcased on its interactive portal and also distributed online. A :30 TV spot and :15 online video were edited down from the long-form. These were aired on U.S. network and cable TV, as well as across Esurance’s digital video buys. 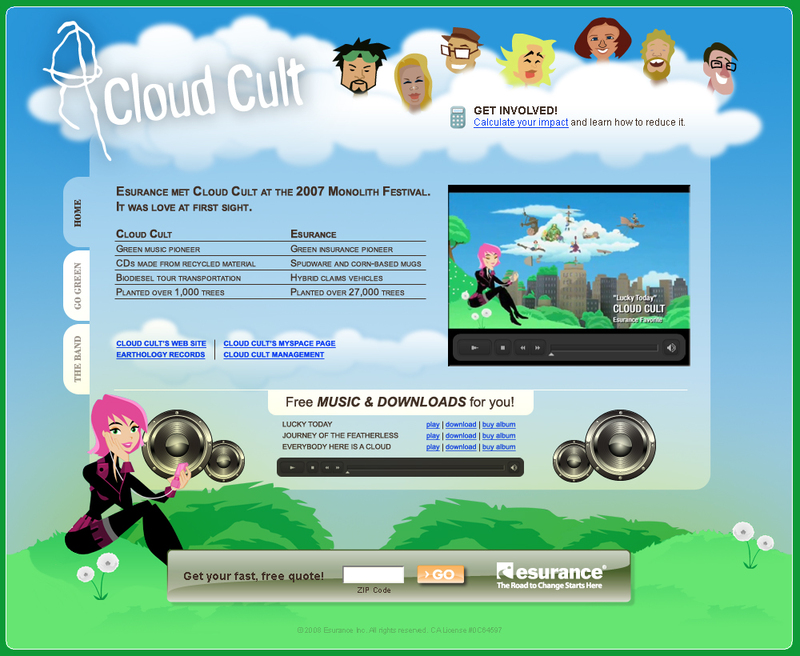 In 2008, the Cloud Cult/Esurance ad was featured as one of the Top Ten Best Uses of Music in Ad Age. Because this relationship was such a compelling illustration of Esurance’s core values, public relations efforts were heavily focused on promoting it. Rich content press releases were distributed on the newswire to promote the interactive micro-site. Both Esurance and the band discussed the relationship with their customers and fans. Positive local TV news coverage in a key market was obtained during an event to raise awareness for a Denver children’s charity. Esurance, local concert promoters, and the band worked together to put on a small concert and tree planting for sweet kids at a local school.